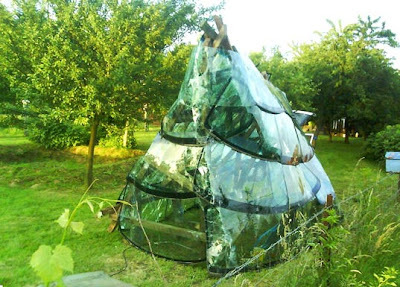 Imagine a crystal tent, part greenhouse and part recycled glass art. I could imagine spending all afternoon under this sculptural work, over at Inhabitat. “I like the idea of recovery,” says maker Sebastien Ramirez, who created this warm cocoon without a budget. That's a very creative use of windshields! Oh, and my coleus propagation terrarium experiment failed! lol! I think I might have underwatered it.